There are some “hanging issues” related to some verdicts, German Chancellor Angela Merkel said on Wednesday, with Egyptian President Abdel Fattah al-Sisi standing by her side. 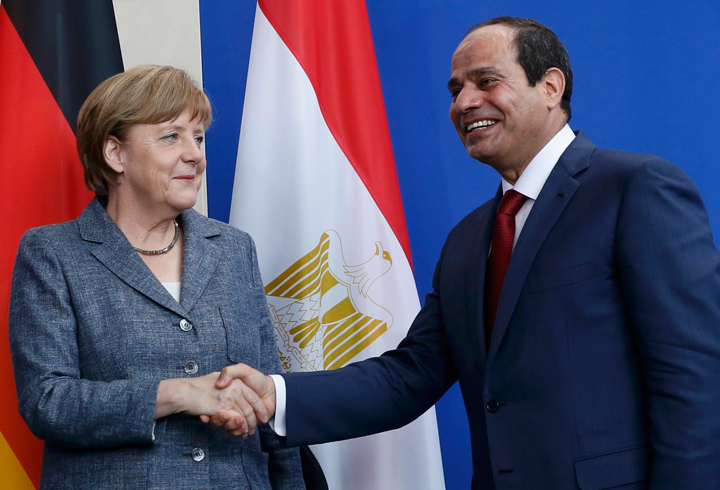 In a joint press conference, aired live on Egyptian state television, Merkel said she and Sisi discussed human rights and how “Egypt is trying to protect them”. Sisi said “we also love freedom and democracy in Egypt” but cited “very difficult” circumstances Egypt is facing. There are shortcomings, no doubt, he admitted. Sisi said he and Merkel discussed recent death sentences, adding “we respect the Egyptian judiciary … and cannot comment on it”. On May 17, former Egyptian president Mohamed Mursi and more than 100 others were referred to the Grand Mufti, a step that is taken in Egypt’s court system ahead of issuing a death sentence. A final court decision is expected on June 16. He added that the majority of the death sentences are issued in absentia, which means the sentences are nullified the moment the defendants are brought to court. “These are not exceptional or revolutionary courts”, he said. On the sentences, Sisi finally said that this is the first step of litigation and all death sentences are challenged by Egypt’s prosecution before going into the next step of litigation. Last month, Norbert Lammert, the head of the German lower house of parliament cancelled a scheduled meeting with Sisi, citing an “unbelievable number” of death sentences. Merkel and Sisi discussed Egypt’s role in the fight against militancy both inside Egypt and in the region. Merkel said “Egypt has a prime role in fighting terrorism” and “freeing Egypt and the region of it.” She described militias in the Middle East as representing a great threat. Sisi is on a two-day visit to Germany after being invited by Merkel. Sisi earlier held talks with German President Joachim Guack who welcomed the Egyptian president in Bellevue Palace with an official ceremony. Would You Revoke Your Egyptian Nationality?